200 pages | 22 B/W Illus. 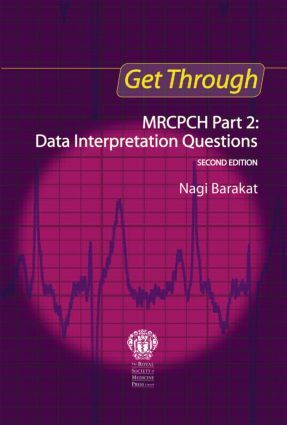 Get Through MRCPCH Part 2: Data Interpretation Questions is based on the original title, 100 Data Interpretation Questions in Paediatrics for MRCPCH/MRCP, and provides valuable revision material for candidates sitting the two written papers for Part 2 of the Membership of the Royal College of Paediatrics and Child Health (MRCPCH) exam. This new edition has been revised and expanded and now includes four different question types: best of list; n from many; extended matching questions; and questions to which a written answer must be given. This gives the reader practice in real-life exam style questions as well as more open-ended questions that don't appear in the exam but really test the reader's knowledge while they are revising. It will prepare candidates for questions dealing with data interpretation, including ECGs, EEGs, growth charts, lists of test results and other materials commonly encountered in the examination. The answers are supplemented by invaluable extra information to help the reader understand why an answer is right or wrong, and to aid further revision on the topics covered. All cases have been selected according to the criteria of the MRCPCH exam, comprehensively covering all paediatric topics and coming from years of genuine clinical paediatric experience. This is an essential text for all candidates sitting the MRCPCH exam, as well as examiners and trainers for those exams, senior house officers, specialist registrars and their overseas equivalents.